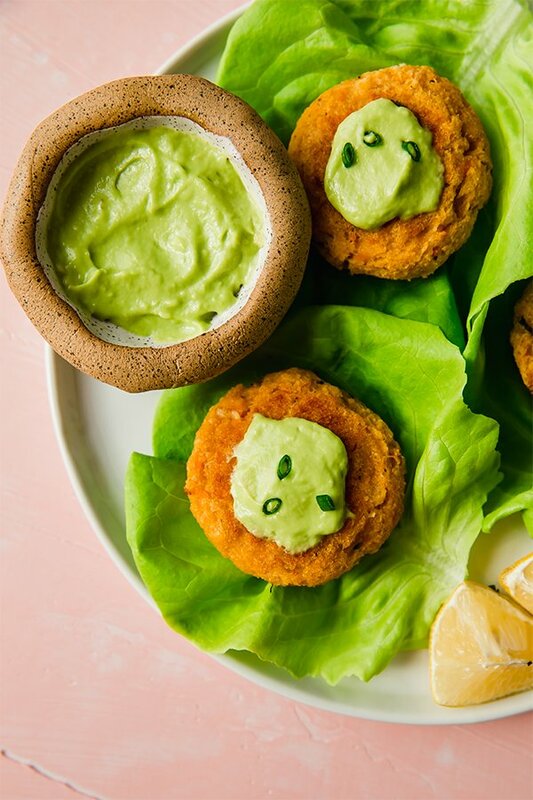 These gluten-free sweet potato crab cakes with avocado horseradish mayo are easy and delicious! This recipe is paleo, whole30, and AIP compliant. I love crab cakes, salmon cakes, tuna cakes… any kind of cake, really! If it’s in cake or burger form, I’m probably going to be a fan! Crab cakes are a classic appetizer, but really they can be a main dish too. Especially when they’re packed with other hearty ingredients like sweet potato and topped with a creamy, spicy sauce. 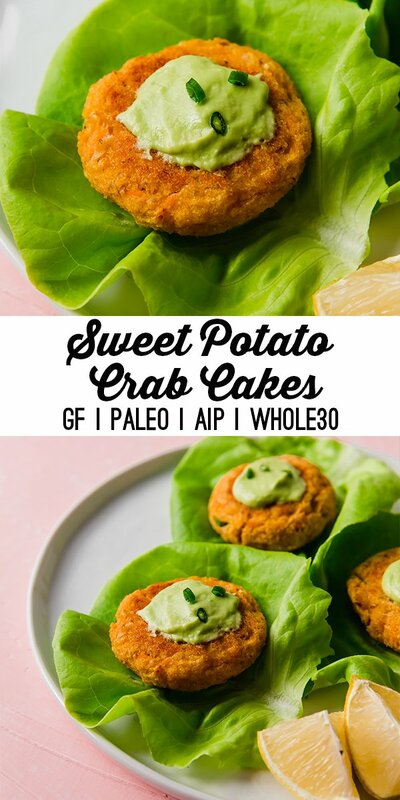 I’ve always thought of crab cakes as the kind of fancy restaurant food that I just wouldn’t be able to eat again, but these gluten-free sweet potato crab cakes are incredibly simple to make at home. 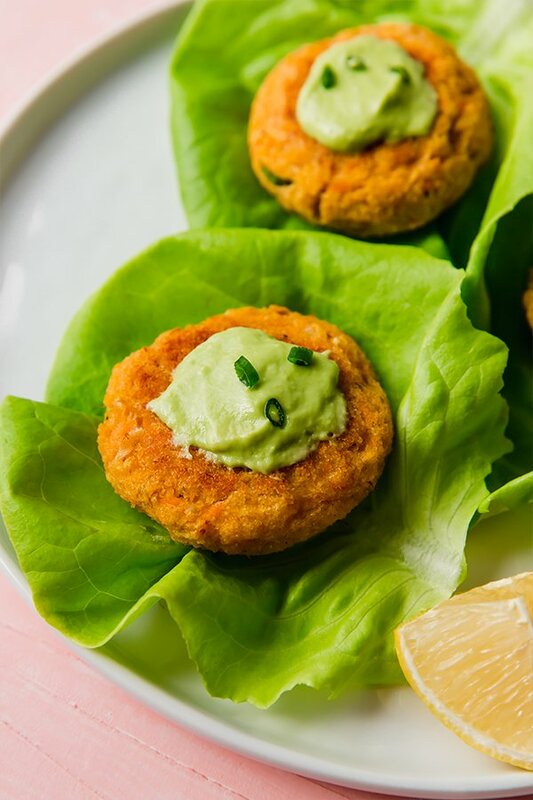 They’re paleo, whole30, and AIP compliant, and make the perfect appetizer, dinner, or even leftover lunch when you want to mix up your proteins. You can either buy canned crab (which works totally fine for a recipe like this) or fresh crab. Be careful of citric acid if you’re using canned, but if it doesn’t bother you, there are plenty of canned crab options that work. If you used canned crab, it’ll be about two cans for this recipe. You can also use fresh crab from the fish counter at your grocery store and just ask them to weight it out! Ever since making my sweet potato chicken popper recipe, I’ve been in love with making recipes with proteins and sweet potato! It’s a great balance of protein and healthy carbs. I used just standard orange sweet potato for this recipe, but you can use other varieties. 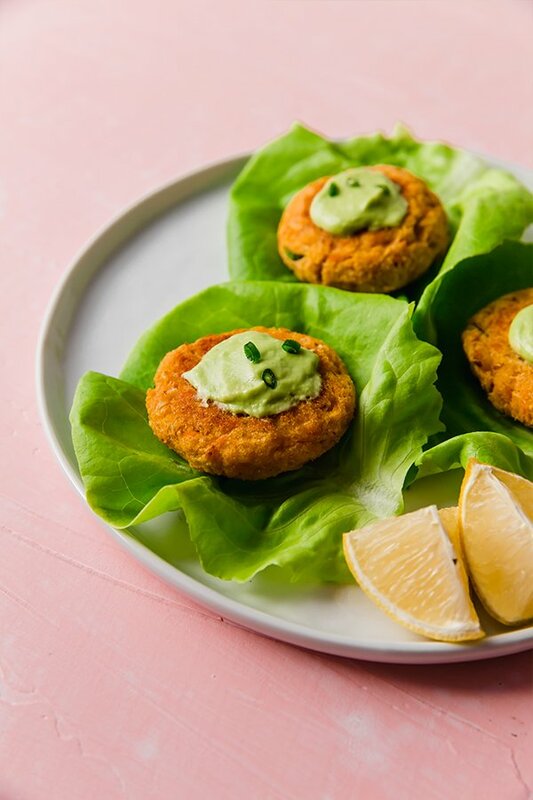 Crab cakes with traditionally have flour to bind them, and the is my favorite gluten and grain free blend for this particular recipe. You can likely swap arrowroot starch for tapioca, but there isn’t a good 1:1 swap for coconut flour in this recipe. If you can tolerate eggs, you’ll use one egg. If you have an egg intolerance or are following an AIP diet, you can easily use a gelatin egg instead. Follow the notes of the recipe for the instructions of how to make it. Horseradish is not only nightshade free, but it pairs really well with crab! I love using horseradish powder to spice up dishes. This recipe uses horseradish and avocado to make a creamy topping for the crab cakes. Preheat the oven to 375 F and line a baking sheet with parchment paper lightly greased with avocado oil. Portion out the crab and use a fork to break up any large chunks. The meat should be fine. Combine the crab meat, sweet potato, flours, and seasonings (reserving about 1 tsp green onion for topping) and mix well until combined. Add the lemon juice, avocado oil, and egg (see notes for gelatin egg) and mix well. Form the mixture into uniform crab cakes (you should have about 8) and place on the greased baking sheet. Bake in the oven for 25 minutes (or until crispy), carefully flipping about halfway through. Remove from the oven and allow to cool slightly before topping with horseradish avocado mayo (see below) and green onion. Combine the avocado, avocado oil, lemon juice, and salt in a blender until smooth. Add in 1 tsp of horseradish powder at a time and taste as you go. Adjust horseradish amount to desired taste. For the gelatin egg substitute – Add 1/4 cup water to a small sauce pot and slowly sprinkle in 1 tbsp of gelatin. Use a fork to gently mix in any clumps. Set aside and allow the mixture to harden for 2-3 minutes. Place the pot on the stove and turn the heat on low heat. Slowly melt the gelatin over 1-2 minutes. Immediately remove from heat once the gelatin has melted and the mixture has returned to liquid. Vigorously whisk the liquid until it becomes frothy. Pour in the crab cake mixture immediately to swap for an egg. This was the best ever! Before reading carefully I purchased the best-quality crab I could find (I’m sure that didn’t hurt – I’ll try it next time with canned LOL). Also didn’t have horseradish powder on hand, but minced some fresh horseradish root and put it into the mini-cuisinart with the avocado mixture. These are BETTER than the old-school crab cakes. DIVINE! I love Unbound Wellness recipes! These are bomb. I even messed up the recipe because I realized I was out of coconut flour after I already started (I used it for a dessert the day earlier and forgot, oops lol) and didn’t have enough avocado oil. The internet told me to sub the 1/4c of coconut flour with 1 c almond flour (a reintro for me), and it worked. And I used olive oil in place of the avocado oil I didn’t have. I also didn’t have horseradish powder so I just used minced horseradish root. These are like little clouds of heaven. I ate 3 and had to stop myself so I had lunch for tomorrow. I used the crab that’s in a can the kind that’s refrigerated at the seafood counter, not the shelf stable kind, but maybe next time I’ll try that so it’s less expensive :). But, it was totally worth the expense. SO GOOD. Thank you so, so much Sarah!! I’m so happy that you liked them! !